5 Reasons Why You Should Keep a Fitness Journal? Anyone interested in getting in shape and staying fit can reap the benefits of an exercise journal. According to Dr. Neil Gordon of the St. Joseph's/Candler Health System in Georgia, exercise journals bring consistency and accountability into an exercise program. Most individuals begin a new exercise program with the best intentions, but may fall short of their goals or end up abandoning them altogether. Maintaining an exercise journal helps a person keep track of progress and see firsthand if he or she is sticking to a steady exercise routine. Exercise journals are useful for those who exercise at home. One of the benefits of an exercise journal in a home scenario is that it serves as a reminder to work out. If the exercise journal is sitting in a prominent location around the house, it will serve as a reminder of fitness goals. Those who exercise at the gym under a personal trainer can also glean the benefits of an exercise journal. A personal trainer generally keeps their own notes of a trainee's progress, but if the trainee is keeping personal notes as well, they can be referred to at home or when done with the personal trainer. This sort of record keeping should also motivate and inspire trainees, who might otherwise not realize the extent of their progress. More: Why Hire a Personal Trainer? Exercise guide Paige Waehner of about.com believes exercise journals are essential for any fitness goal, regardless of whether the goal is to lose weight, gain muscle or win a race. It helps users make sure they're performing all aspects of their routines, including warm-ups and stretching, and how many repetitions of each exercise they perform every day. Other benefits of an exercise journal include scheduling capabilities. One of the biggest barriers to fitness success is an irregular fitness schedule. Working parents often forget or can't find time to exercise between work and caring for their children. 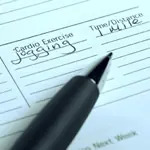 Keeping an exercise journal helps busy people schedule exercise routines that fit between their activities. Exercise.com is dedicated to help you improve your health and get in shape with the right diet and exercise. Now's the time to get started...and get results.